What an AMAZING Sunday we're having in England right now!? I've already been for my run this morning and happily did over 2 miles in this lovely weather. It's only been a week, but for someone who hasn't done much for exercise since school I think that's pretty good don't you!? It is absolutely boiling outside and there is no way I'm going to miss out a trip to the pub garden for a drink out in the sunshine! 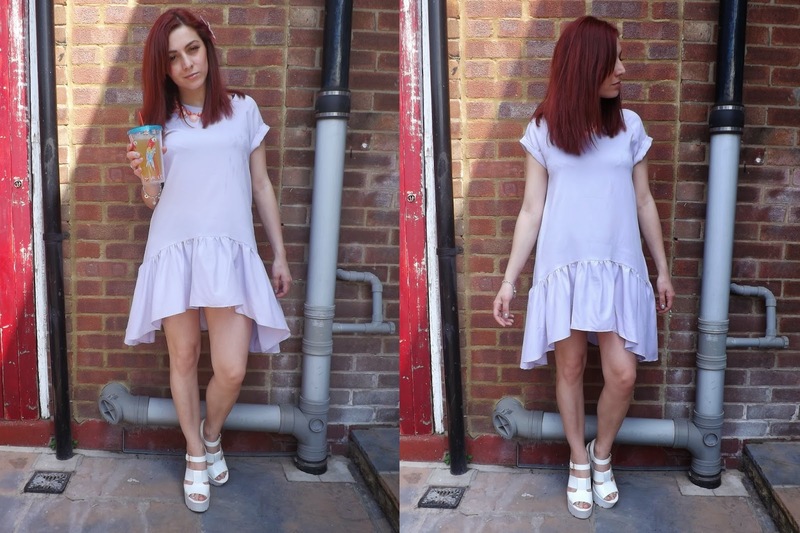 As well as the weather being perfect for a barbecue, a trip to the pub garden, for a run, or for a trip to the seaside, for me it's perfect weather to wear out my lovely lilac dip-hem dress courtesy of Laundry Boutique. I am in love with this dress! The shape is so different to anything I've worn before and I love the t-shirt style top half with the peplum style dip-hem! Of course, my favourite shoes are out again for the day and I've finally wearing out my coral seashell necklace that my Aunt Olive gave to me a few years ago. I wasn't really fond of it back then, but I love it now! Also obsessing over my new 'Stabucks Style' cup from New Look that I bought the other day! I love it so much, and it comes with a screw on lid so spillages are basically impossible, as well as the straw being non-detachable from the cup when it's closed. I have bitten a crack into the top of the straw... Force of habit! I'm out to go see John now and see if he drives me to our local pub garden, which is also where we had our first date! Hope you're all having an amazing Sunday in the sun!